Nice drill, posted by Matt Kuzdub. By itself and with some variations, this is also a good exercise to improve decision making and executive functions. By the way we can use it as „Trick the mind“-Drills to improve mental strength. e) player or coach announces target (animal) and uses another animal name for spin or ball height (f.e. „snake=flat“, „giraffe= high over the net“), then f.e. „tiger-snake“ or „tiger-giraffe“,…. 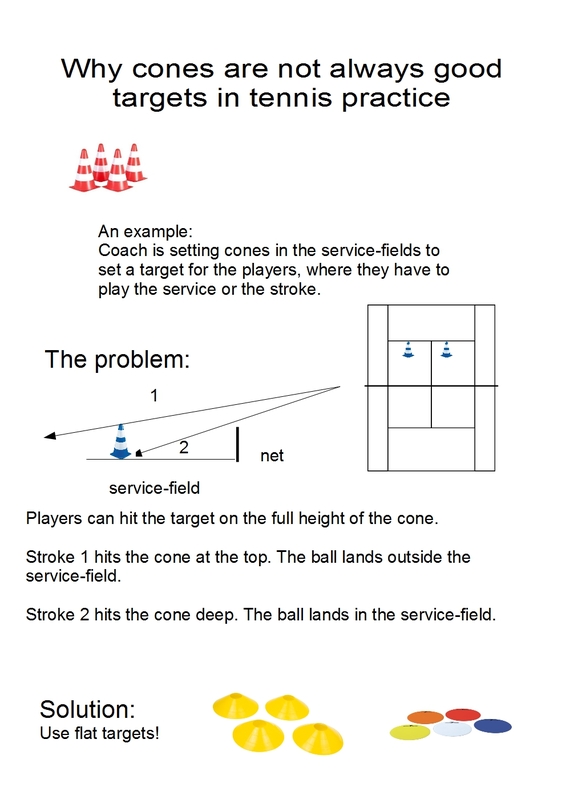 Different learning seems the best way to learn tennis. in closed situations, like the service, there are a lot of ideas, but they are not complete. 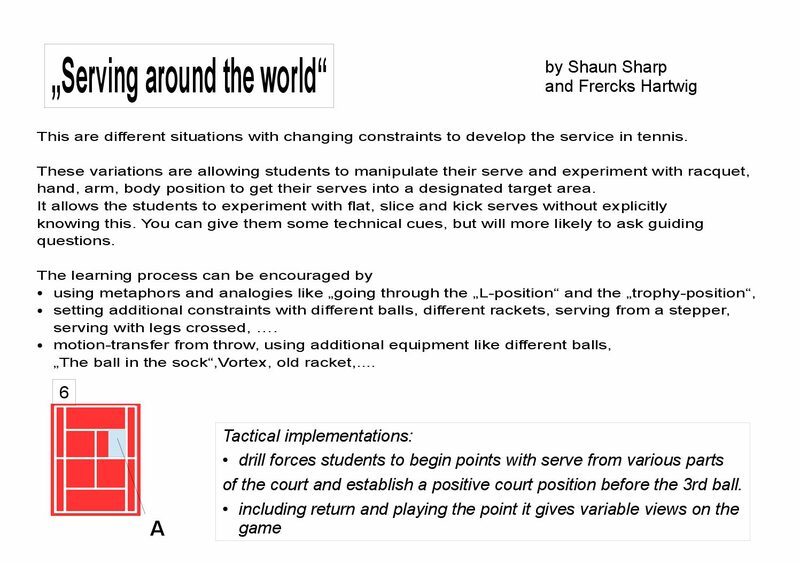 Shaun Sharp, tennis coach in the Meehan Tennis Academy in Melbourne has developed and experienced with drills that are based on serving from different positions and different targets. Constraints led coaching: modify court-size. A and B play rallies. 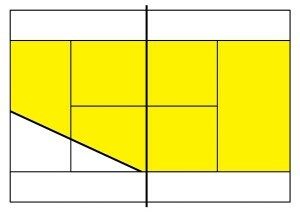 The size of one court side is modified (picture). Like a piece of cake is sliced off. This makes a difference and forces both players to a modified view on the game and on tactic. 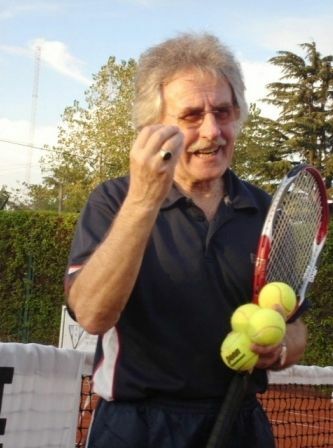 Brenton Jon Bakker worked as Tennis Coach in Japan. He recognized, that believing in the self-organization-ability of the player by using and setting targets gives the coach time to work on the players strategy. In his view, tennis has become too technical. A longer version of his position in http://www.womenstenniscoaching.com/technique.html#.Vy9w8W5ly6w.facebook. Fokussierung auf die Aufgabe, „Konzentration auf das Wesentliche“ ist ein Grundgedanke des INNER COACHING. Erreichen lässt sich dies unter anderem dadurch, dass der Spieler zur eigentlichen Aufgabe eine weitere Aufgabe hat. Z.B. wenn er/sie auf das Bewegungsgefühl achten soll: Wenn der Spieler ein gutes Gefühl bei seinem Schlag hat, dann ruft er laut „Ja“. Das kann auch unabhängig vom Ergebnis des Schlages sein. 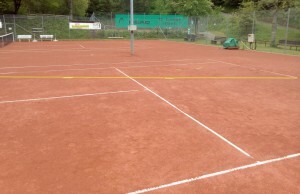 Set different coloured marks on the courtside of player B. 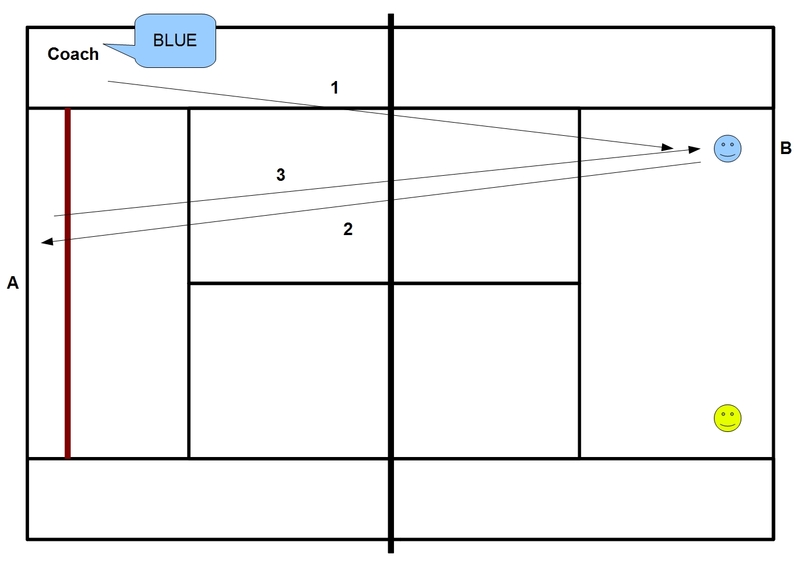 The blue one in the deuce-court, the yellow one in the add-court, in the near of the baseline. Mark a line on the other courtside, one big step from the baseline, so that you have a targetfield between baseline and the marked line. Player B has to play the ball into the targetfield. Player A plays his ball in the near of the announced coloured targets.